New Business or Personal starter website package. First, we set your site up for you, add your logo, upload your images and up to 5 pages of content (you must supply the content). Then after set up, you can publish an unlimited amount of your own content, including stories, article, photos, videos and more, all in the admin dashboard. You control the site. Don’t forget hosting? Select a Hosting Plan from below. This is a personal or business starter website. We build this site using the Free Genesis Sample templates. It is a great starting point or platform to build from, and is perfect to get your business up and running immediately. This package is not ideal, for websites owners who get larger flows of web visitors. Free templates are great to start with but you will need to be upgraded as your business grows. Choose one of our plans or provide your own cpanel login. *You will need cpanel hosting,. We proceed to build it fast. First, our guys set up your hosting account. What is Hosting? If you want a website, hosting is required. If you already have a website, then you should have hosting, just supply us your cPanel logins. Introducing Professional E-Commerce Business Websites. This is our premium package. This product includes a complete custom designed e-commerce online selling machine. It is great way to professionally sell products and services online, complete with payment processing. Need Hosting? Check out our hosting plans. Professional wordpress business websites comes with everything you will need to do business on the internet. It’s the complete package. This website package includes your own completely original custom design, built to your exact requirements, corporate colours, everything. This is not a template design. We use the best of wordpress, business tools to help you run your business. Need Hosting? Check out our hosting plans by selecting below. This package is a premium website which comes included with a premium template or Theme. It’s a great way to get an affordable easy-to-learn online business set up immediately. With loads of room to expand in the future. This package is built, ready to expand, with easy modular features that can be added as your online business grows. Need Hosting? ( What is Hosting? ) Don’t forget to choose a hosting plan. Set up your new business online store or a personal website package that allows for ordering online. We include your logo, images and content. You can then self publish an unlimited amount of your content, including products, stories, articles, photos, videos and more inside the admin dashboard. 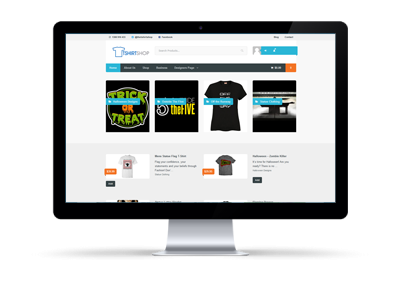 Ask us about including t-shirt drop shipping software. Included free if required. If you’re looking for an affordable E-Commerce starter website that has all the functionality of expensive shopping cart systems. Then this package is for you! It’s a great way to start your online store and begin taking payments online right away.